Taglines: The Magical Fantasy Adventure Based on the Bestselling Book. 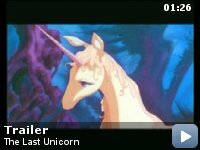 In September 2003, Carlton Communications, successor to ITC Entertainment, claimed that they earned over a million pounds in revenue from DVD and cable TV sales of The Last Unicorn. 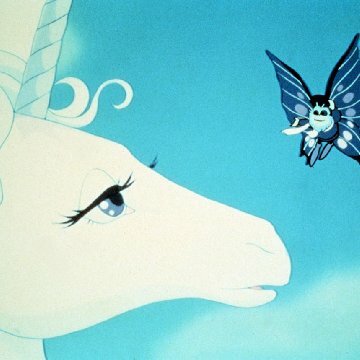 During this period, Peter S. Beagle had not received his contractual share of the income, which includes 5% of the net profits from all revenues from the animated film, 5% of the gross revenues from all related merchandising, $20,000 for any and every sequel or remake, and various fees for any possible television series adaptations or spinoffs. When negotiations with Granada over this issue failed to yield any results, a public campaign for support was launched on Peter's behalf by Conlan Press in August 2005. King Haggard: I know you! I almost knew you as soon as I saw you on the road coming to my door. Since then, there is no movement of yours that has not betrayed you! A pace, a glance, a turn of the head, the flash of your throat as you breathe... even your way of standing perfectly still - they were all my spies! 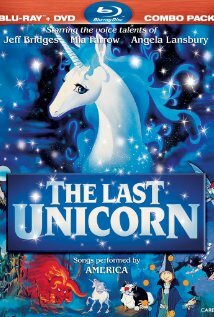 The first time I saw this movie was when I was very young. So young, in fact, that the only things I can remember about this movie are subtle images; I couldn't even remember if I liked it or not. Now, more than twelve years later and after reading the book, I can honestly say that this is a truly great film. I have seen very few films that have actually brought me close to tears, and most of those movies are ones I didn't like. 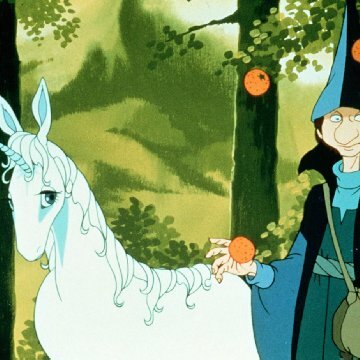 The Last Unicorn is an especially good film not just because it stays true to the book, which animated films are rarely good at, but also because it breaks away from the Disney formula for telling the story. All the characters in this film are sympathetic in one way or another, including the villains King Haggard and Mommy Fortuna. Many people would ask why a villain would need to be sympathetic? The simple answer is they don't. The villains are sympathetic though because they are human. The unicorn herself doesn't truly become sympathetic until she is transformed. 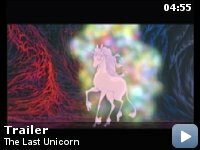 I say this film is in the spirit of the great filmmaker and master animator Hayao Miyazaki, a Japanese director, because even though this film is a fantasy, it is not a fairy tale. Miyazaki has become famous for making animated films that are enjoyable for children, but are also sophisticated and deep enough for adults. What makes this movie great is its story. One of the things that makes this movie so special for me is because it has become one of my favorite love stories. More specifically, it is a story about hopeless love. There are only four love stories, this one included, that I regard as my favorites. One them being Princess Mononoke, one of the many great films by Miyazaki. It is also a unique love story because it is about true eternal love. How is it eternal? I will not say because I don't want to spoil the movie. My only real complaint about this movie is that the animation isn't very fluid, but I am willing to let that slide because the film was obviously low budget. I only hope that the live-action version will be as good and hopefully even better than the animated version, because even though this movie was well paced there were certain things from the book I hope they mention in the new version that they didn't have time to put into the animated version. I also hope the live-action version is as truthful to the book as this movie was, and leans more to the adult side of the story so more emotion and character development can come out of it. You're never to old to believe in the impossible.